Your skin acts like a mirror to your body. If you are happy and healthy, it can be noticed from your skin. Being the largest organ in the body, when some health issues arise, it may show from your skin. We have to be alert on what is happening with our body and not only how best we look. We should not neglect the changes which suddenly occur, that may point towards a serious illness. Always make sure to seek medical help if an unusual rash or symptom appears in your skin, which may be associated with an underlying disease. The earlier you seek help, easier it will be to analyze and treat the issue. Described below are some such symptoms that can appear on the skin, which might be associated with underlying skin diseases and disorders. It is always good to know about these warning signals and update your knowledge about underlying diseases. Having such symptoms doesn’t mean that you have the disease always. But being aware and seeking help early will help both doctors and you to exclude such skin diseases and disorders and prevention of worsening it by starting treatment early where necessary. Dark spots and patches on your skin usually increase with age, as it is a natural aging phenomenon. However, if the appearance of dark spots is sudden or if already existing ones become enlarged in size, darker in color or increase in the number you have to be alert. The dark patches may be associated with Addison’s disease, which is the insufficiency of the adrenal gland. You may also have loss of appetite, loss of weight, severe muscle and joint pains. The faintish feeling may arise due to low blood pressure and low blood sugar levels. Dark spots may be the starting symptom even before other symptoms. So, the sudden appearance of dark spots always needs professional help. Have you noticed that your skin is losing pigmentation in certain areas? It may occur the in the face, around lips, hands, limbs or anywhere in the body. It may be due to Vitiligo. Sometimes there is a family history of a relative suffering from it. These white patches are more apparent in dark-skinned individuals. The melanocytes in the skin form the pigment Melanin which gives us color. In Vitiligo, the body’s own immune system attacks these melanocytes. When they are destroyed they can no longer produce melanin, thus making the area white or hypopigmented. Vitiligo is difficult to treat and there is no cure. The earlier you visit your doctor, easier it is to analyze and treat early to prevent spread. There may be swelling (oedema) in hands and feet on and off especially if you stand for long periods, during pregnancy etc. However, if you get oedema almost every day, it should not be taken lightly. Seek help from a physician or an endocrinologist as you may be having hypothyroidism. The thyroid gland in the body does not produce enough thyroxin to function. You may even notice a goiter as a swelling of the neck. There may be other symptoms associated with hypothyroidism such as dry skin, loss of hair, weight gain, brittle nails, lethargy and constipation along with facial puffiness and oedema of upper and lower limbs. Moles are harmless. It may be hereditary. 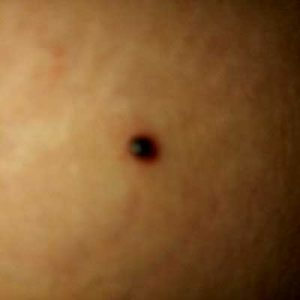 But always be alert if they suddenly increase in number and develop new moles. The existing ones may enlarge, change color or become painful…..always seek help. It may be a precancerous lesion due to excessive exposure to Ultra Violet light. The doctor may take a biopsy from the lesion to exclude any underlying disease. 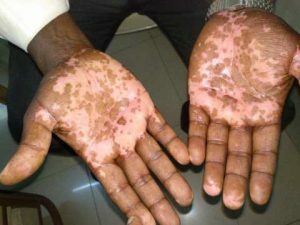 Flaking is peeling off of skin especially over palms, soles, face etc. Skin peeling can occur due to sunburn, prolonged contact with certain chemicals and as an allergic reaction. However, if flaking is continuous and recurring, it may point towards an underlying illness. 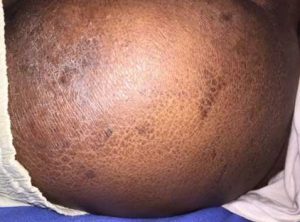 It may be due to Psoriasis which is a chronic recurrent skin disease where the skin cells multiply rapidly and extra skin cells form scales and red patches. Flaking may occur in Dermatitis which is inflammation the of skin due to various reasons like Eczema and allergies. Flaking can occur in some hormonal disturbances and vitamin deficiencies too. Always go to your doctor if flaking is severe and continuous. If you have excessive sweating even while in a place with good ventilation and optimal temperature and if you notice that for some time always seek help. It may be due to excessive production of Thyroxin hormone as in Grave’s disease. It is an autoimmune disease which affects the thyroid gland leading to a toxic goiter. The skin will become thinner and itchy. There may not be a visible goiter always. There can also be diarrhea, agitation, heavy menstruation in females due to excessive thyroxin. If you notice these symptoms, seek help from a doctor without delay. If you develop a sudden rash, which involves a large area of skin or your face that doesn’t go away with time do not take it lightly, as there may be something going on inside your body. A rash can appear due to an allergy, maybe to certain foods, chemicals, the medication you are taking or cosmetics. 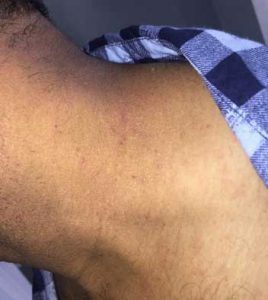 An allergic rash may even associate with anaphylaxis (severe reaction with difficulty to breathe, chest pain etc.) which can be life-threatening. 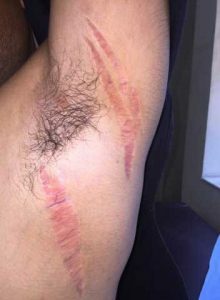 There are also sudden rashes which appear in Steven Johnson syndrome and Toxic Epidermal Necrolysis (Lyell’s syndrome) due to the severe allergic reaction. Seek immediate treatment in these instances. A rash can be a contagious infection like Chickenpox or measles. 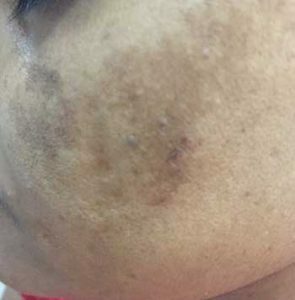 Always seek treatment if long-standing rashes over the face which are unusual, as it may associate with serious autoimmune diseases like SLE (Systemic lupus erythematosus). Acne is common in teenagers and young adults, due to excessive production of oil and clogging of tiny pores which brings natural oil (sebum) to the surface. But there can be the underlying imbalance of hormones like excessive Testosterone (male hormone) or Cortisol (stress hormone). Acne can occur due to digestive problems in your gut. It is a must to take proper facial skin care, however, If your acne is uncontrollable always seek help. Get your skin diseases and disorders treated instantly with our app. Download our app and find your probable skin condition.